Will We Have Email Conversations With Our Devices? Most of us communicate daily with other humans via email, but what about devices? What happens when your devices begin to have intelligent conversations with you via email? Would it be easier to simply reply to an email vs login to a web interface or launch an app to command your devices? In this post we’ll explore what’s currently possible and stimulate some thought towards the next generation of intelligent hardware communications. Back in January at PennApps, the Mrs. Coffee team explored conversations with a coffee maker via email and SMS with their coffee hack. Many of us have a daily relationship with our coffee, but are you ready to start talking to your coffee maker, by email? If this sort of hardware hack interests you, add an Arduino to your arsenal. The cost is nominal and there are infinite combinations of extensions to explore. So how do you get started with communicating with hardware via software? In the case of an Arduino, its amazing community has created a plethora of libraries that make that process easy. You can also find all of the source code on Github. Sparkfun has many tutorials to get you started; it was with their content I taught my eight year old daughter how to program an Arduino. A good place to start is with Julia Grace. 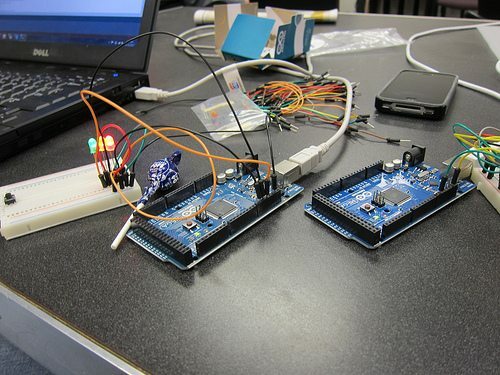 She has created a awesome intro to Arduino hacking tutorial at her blog. Be sure to also check out the tutorials she references at the end of the post. Former SendGrid Developer Evangelist Swift created BreakfastSerial library in Python that allows you to use Python to communicate with your Arduino’s through a serial connection (hence the awesome library name). For a cool weekend project, you can build a motion sensor that emails you when it detects motion within a certain time frame. You can find all the details and source code at the MongoLab blog. This implementation also logs data to a MongoDB database via the MongoLab REST API. Now, you should have enough information to create some very nice hardware hacks, perhaps at the next hackathon you attend. If you decide to create something extraordinary, let us know about it in the comments below. 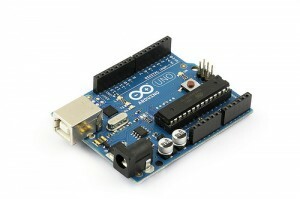 Also, don’t hesitate to reach out if you have any questions regarding how to leverage SendGrid’s APIs with an Arduino.